Community outreach and service learning is critical in teaching children an awareness of the world outside themselves and the needs of others. Beginning in The Twos, each class is involved in a variety of projects throughout the year. They learn that working together can change our community for the better. Students participate in activities that are designed to instill a life-long commitment to giving back to their community. Food Pantry Collections: The children participate in collecting food for families in need three times each year. 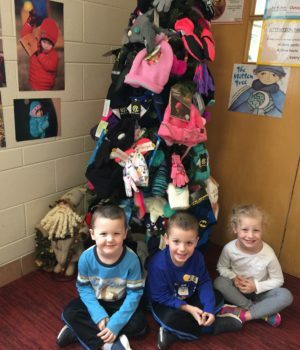 Mitten Tree: The children participate by bringing an outdoor item (mittens, gloves, hat or scarf) to school to place on the tree for the children of a Hispanic church in Waukegan, Iglesia Episcopal Nuestra Senora de Guadalupe. The preschool children have the opportunity to learn lessons of love and experience the joy of giving and sharing. Orphans of the Storm Animal Shelter: Our students collect items to donate for Orphans of the Storm Animal Shelter.